Nothing will make your new house feel more like home than adding your personal artwork. Hanging photographs, wall art and collectibles will bring your own personality and drama to any room. The first step is to pick the most important pieces you want grouped together. Avoid the clutter of displaying every piece you own, and instead choose the pieces that fit your taste and mood as of now. 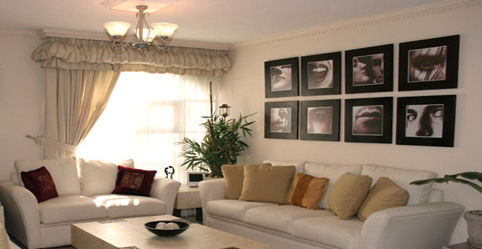 It is an easy update to any room to switch out pictures when your mood changes. Once you have the sizes of each piece decided, lay out the grouping flat on the floor before attempting to hang on the wall. Experiment with placement and overall size, until you come up with the layout that suits you and the pictures the best. Since our eyes appreciate order, it is best to design your pictures in an overall square or rectangle. This allows you to vary shapes and sizes in the set box. The only time you should stair-step your artwork is if you're hanging them on a stairway wall. If placing the grouping above a large piece of furniture, a good tip is to put larger items above the smaller ones to balance out the overall focal point. If the grouping will be on a blank wall, place the larger pieces at the bottom as an anchor for the design. Height is essential to the overall look of your artwork. Hanging a print, or group of prints, too high above a piece of furniture can leave the two segments disconnected. A good rule of thumb is 6-8 inches above furniture. And, if placing the grouping on a blank wall with no furniture, a guideline to uphold is to place the top of the lowest piece 58 inches above the floor. This ensures a solid, average eye level of the people who will be viewing the artwork. Although, if you’re using art that is small in overall size, and in an area where it will be viewed from a sitting position, you can also place the art at seated eye level. Spacing is also a vital key when placing art. When grouping multiple pieces together, leave at least two inches around each frame on all sides, making sure that every open space is consistent and even. Also, keep in mind every other object in the room. Every item plays a roll in the overall design. Keeping a balance between artwork, furniture and other items such as lamps is key. Choosing the right hardware to hang your priceless artwork is a crucial factor as well. Picture hooks are much more stable than basic nails. Hooks are designed to redistribute the weight suspended from them, pushing the weight into the wall as well as down. Hooks are usually sold according to the weight they are able to hold. Use at least two hooks, spaced about half the width of the frame. Unless you’re hanging something that is more than 60 pounds, you won’t need to bother using anchors. With any picture or piece of art, it is important to protect it to ensure it will stay beautiful for many years. Always request that acid-free materials and UV protected glass be used when having your pieces framed. Also, pay attention to the lighting of where you want your art to be hung. Never place your pictures in direct sunlight where the rays will destroy the picture and the frame itself. And, be careful of the heat when hanging pictures above the fireplace. The artwork you choose, and how you choose to hang it is, of course, up to personal discretion. Hanging art is one of the easiest ways to make any new house your home, making you feel comfortable, and giving your guests a glimpse of your personality and style.